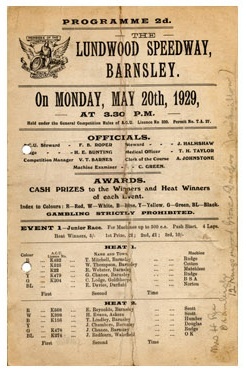 Barnsley was one of the first areas in the country to hold speedway meetings although their history is short. Records show that the first meeting took place on 29th May 1928 at Lundwood, as indicated on the very rare badge shown below. Lundwood Dirt Track was a 380 yard track built on a hillside and situated on the Pontefract Road in Barnsley. There were none of the usual luxuries, no pits and no stands, and racing was organised by Barnsley Motorcycle and Car Club. It opened for Dirt Racing on 29th May 1928 when it was Open racing. 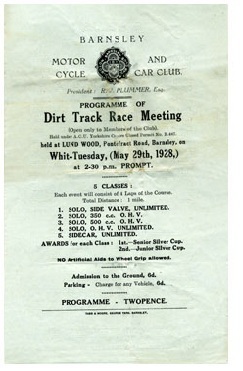 The next year they took part in the English Dirt Track League, and I am guessing you might have attended one of these meetings. Do you have any memories of it which you could share with the site? Maybe your dad, granddad or uncle remembers Bob Allen who established the track record and won the Silver Sash and All-Star scratch event. 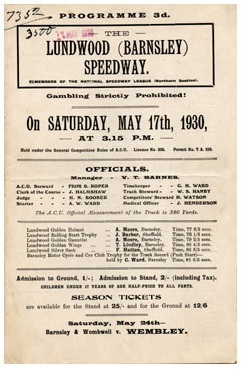 Indeed the very first speedway league match was staged at Lundwood when Barnsley competed against Leeds. The very next year, its final year, they offered Northern League racing. However, they resigned from the League when crowd sizes were disappointing. The final meeting was a Golden Helmut meeting on 5th July 1930. The team did not enjoy the support they required to keep afloat and after the 5th July 1930 speedway never returned to the area. 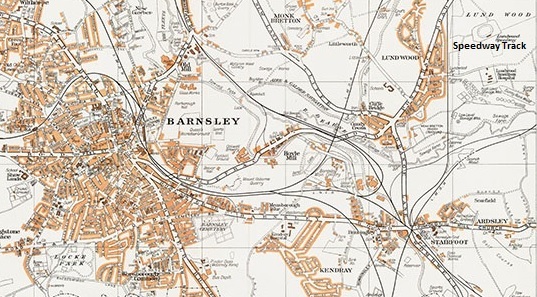 I am grateful to Tom Read, who now lives in South Africa, for the old map of Barnsley and Lundwood shown below. The map clearly shows the location of the speedway track. Tom comments that he was born within 200 yards of the track and learnt to ride his motorbike there in 1954. He later progressed to TT racing, contesting his last race in the 1967 Diamond Jubilee TT. From the track one could see the Monk Bretton church spire in the background.